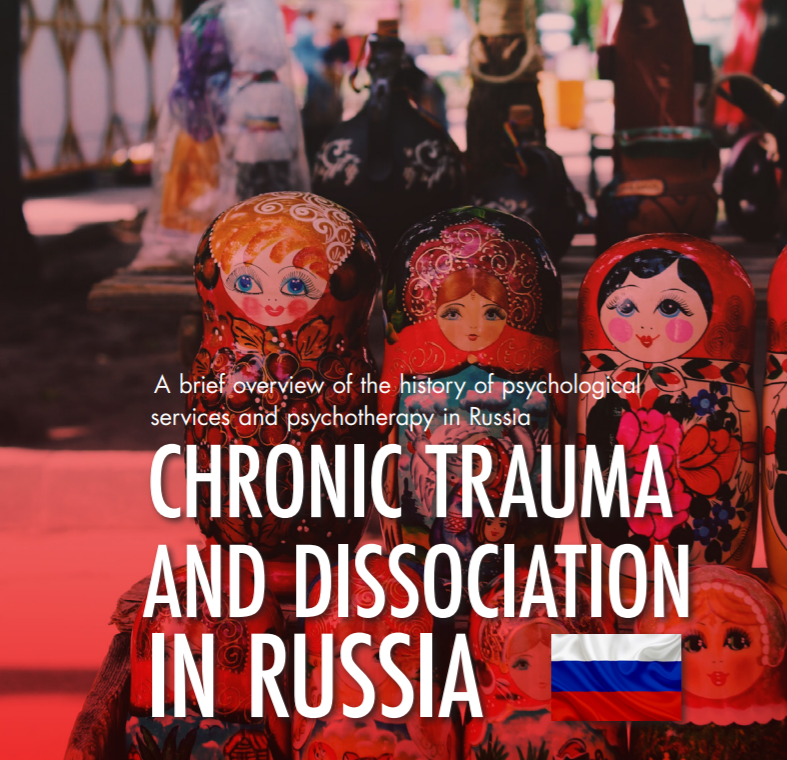 Chronic trauma and dissociation in Russia : A brief overview of the history of psychological services and psychotherapy in Russia. By Elena Kazennaya and Ekaterina Divid, ESTD representatives for Russia. Psychotherapy has developed in Russia since around the end of the 19th century. The emergence of psychiatry as a scientific discipline impacted the establishment of psychotherapeutic practice in this country. Under the influence of the Kraepelin’s German school, S. Korsakov contributed to the development of inpatient psychotherapeutic treatment for patients in mental hospitals. He also introduced humane and non-violent principles of patient care as part of the inpatient treatment. Hypnosis was one of the first psychotherapeutic methods developing in the late 19th and early 20th centuries. It was associated primarily with the name of the outstanding Russian psychiatrist, neuropathologist, physiologist, psychologist and the founder of reflexology, Vladimir Bekhterev, who had numerous internships in clinics of Europe with the most famous psychiatrists of the time – Du Bois-Reymond, Wundt, Meynert, Flechsig, Charcot. The latter had a special influence on Bekhterev by having introduced hypnosis as a tool for treating hysteria. The suggestive methods of treatment continued their development in Russia. In those days, alongside with hypnosis, rational therapy was explored, which is also associated with the work of V.M. Bekhterev and other well-known Soviet scientists, such as I. Pavlov, S. Konstorum, who was the author of “activating therapy” aimed at stimulating the patient’s activities (it combined suggestion, occupational therapy, explanations, biological therapy) and others. In addition to hypnosis and rational therapy, soon psychoanalysis came to Russia from Europe. In 1904, S. Freud published the “Interpretation of Dreams” that produced a controversial reaction among the “physiologically” oriented psychiatrists of the time. However, until 1930 the books of S. Freud and other classics of psychoanalysis continued to be translated. In the early 1920s, the Kazan Psychoanalytic Society and the Psychoanalytic Association for Artistic Expression Studies were created in Moscow. By 1930, due to political reasons, the development of psychoanalysis in Russia had ceased, and psychotherapy continued its growth in the framework of Vladimir Bekhterev’s “physiological” ideas and Ivan Pavlov’s studies of higher nervous activity. In the middle of the 20th century the ideas of Pavlov were developed and embodied in various kinds of suggestive techniques. In the 1930–40s, another Russian psychotherapeutic method emerged – a student of V. Bekhterev, Myasishchev worked on pathogenetic psychotherapy. The central idea of the method was viewing a personality as a system of relations between an individual and the surrounding social environment. Up until the end of the 1960s, psychotherapy had developed within the limits of Pavlov’s perspective, which by the 1970–1980s began to lose its influence and for a period was replaced by a growing number of psychotherapeutic methods, such as the emotional stress psychotherapy of V. Rozhnov, the therapy of creative self-expression by M. Burno, the co-experiencing psychotherapy of F. Vasilyuk, and others. The mid 1980s are considered to be the period when rapid development of practical (counseling) psychology and drug-free psychotherapy began. Since then, the psychological community in Russia has acquired an opportunity to learn directly from European and American colleagues who began to visit this country (V. Frankl, C. Rogers, V. Satir, C. Whitaker, B. Erickson, R. Bandler, J. Moreno, N. Peseschkian, F. Farelly, and others). Since the '90s, autonomous professional associations, psychological centres, etc. have emerged. At the state scale, free hotlines, crisis and psychological support centres for the population were opened. Various ministries created psychological assistance services (for example, the Emergency Psychological Aid Centre by the Ministry of Emergencies to provide critical psychological assistance to the population in the areas of emergency). Psychologists started studying abroad and sharing knowledge with colleagues in Russia via training workshops and seminars. Now, along with psychotherapy, counselling psychology is viewed as a separate branch of psychological science. At present, the Russian psychological professional community is on the threshold of an important stage in its development – the creation of a unified federal law, which is now being actively discussed and elaborated. The draft of the Federal Law “On Psychological Support to the Population in the Russian Federation” was submitted to the State Duma of the Russian Federation on June 24, 2014, and is expected to be adopted tentatively in 2020. The purpose of this bill is to ensure social security and psychological well-being of the Russian population, to grant citizens the right to receive qualified psychological aid, and to regulate the relations in the sphere of psychological services provided to the population in Russia. Nowadays, the activity of psychologists in this country is not regulated at the legislative level, specialists are not licensed, and often do not belong to professional communities that perform the function of regulating and controlling their quality of work. To say the least, this is only a part of those problems encountered by the population due to the lack of a legislative framework. There exists a law of the Russian Federation dated 02.07.1992 N 3185-1 "On psychiatric care and citizens’ guarantees for its provision", which was edited in 07.19.2018. This law establishes the legal, organizational and economic principles for providing psychiatric treatment in the Russian Federation and regulates the activity of psychiatrists only. Psychologists work in various fields, for example, in education (teacher–psychologists) and medicine (clinical psychologists), uniformed services (psychologists in uniformed services), psychological centres (counselling psychologists), as well as in professional associations in private practice, etc. At present, there are many professional associations and institutions in the Russian psychological community that develop various psychotherapeutic approaches. The largest of them are the UPPL (United Professional Psychotherapeutic League), the RPA (Russian Psychological Association), the ECPP-Russia (since 2003 as part of the European Confederation of Psychoanalytic Psychotherapy), the MPO (Moscow Psychoanalytic Society), the “Moscow Institute of Gestalt Therapy and Counselling”, the “Narrative Practice” community, the Cognitive Behavioural Therapists Association and others. Each institution and professional community has its own governing body, ethical code, and internal requirements for candidates who wish to join the community or study a specific method of psychotherapy. Attention and interest to the problem of disorders related to trauma and dissociation have been increasing gradually up to the year 2000 in Russia. The first steps in studying the dissociation related to trauma in Russia were the approval of a structured clinical interview for diagnosing dissociative disorders (SCID-D) within the DSMIV classification (V. Agarkov, N. Tarabrina, 1999), the development of a peritraumatic dissociation questionnaire (PDA) (V. Agarkov, N. Tarabrina, 1998), the adaptation of the screening tool “Dissociative Experiences Scale” (DES) in the framework of a scientific study, in which the phenomenon of trauma-related dissociation is viewed as a defensive mechanism (V. Agarkov, N. Tarabrina, 2002). The following books were translated into Russian: Frank W. Putnam’s “Diagnosis and Treatment of Multiple Personality Disorder” (translated by V. Agarkov, 2004), O. van der Hart, E. Nijenhuis and K. Steele’s “The Haunted Self” (translated by N. Fedunina, V. Agarkov, 2013), and a semi-structured diagnostic Trauma and Dissociation Symptoms Interview, followed by a manual (TADS-I, version 1.9), written by S. Boon and H. Matthess (available in Russian; E. Kazennaya, E. Divid, 2018). In the 2000s, there grew an intense interest in work with Posttraumatic Stress Disorder (PTSD), complex PTSD, as well as trauma-related dissociation among the Russian psychotherapeutic communities of different modalities (psychoanalysis, gestalt therapy, psychodrama, etc.). For example, in the rapidly developing community of gestalt therapy, they began to train specialists working with the consequences of traumatic experiences. In particular, Russian gestalt therapists use the method of somatic experiencing (P. Levine), cooperated with Sylvie Schoch de Neuforn and others. There are some psychotherapeutic areas that do not pay enough attention to the problem of dissociation, for 30 example, in cognitive-behavioural psychotherapy that like the Russian psychiatric community does not express interest in the study of the psychological consequences of chronic traumatization in childhood. It is important to note that the Russian health care system relies on the ICD-10 when considering diagnoses, it prepares the transition to ICD-11 and still avoids using DSM in its work. Now patients with dissociative symptoms can receive the following diagnoses: dissociative (conversion) disorders, borderline personality disorder, depersonalization; dissociative symptoms can also be taken for epileptic manifestations. According to the available data, the diagnosis of multiple personality disorder (F44.8 Other dissociative [conversion] disorders: multiple personality, ICD-10) has never been established in the practice of our community nowadays. EMDR approach has been actively practiced in Russia since 2013, when a professional community was organized under the supervision of the then president of the European EMDR Association, Udi Oren. Since 2014, EMDR Russia has been a member of the EMDR Europe Association. The activity of the Association members complies with the European professional standards and the ethical code of EMDR therapists. EMDR specialists drew attention to the need of considering the phenomenon of dissociation after encountering difficulties in their work with survivors of chronic childhood trauma. It was in 2015 that for the first time the topic of dissociative disorders and possible ways of working with people, who had experienced the chronic trauma of violence, was brought up in the EMDR community of Russia by Sandra Paulsen, with whom the cooperation continues to this day, in particular, by means of supervisory groups. The specialists enter discussions about when it is appropriate to start the phase of processing traumatic memories and discuss the need for long-term preparation of clients (stabilization phase). EMDR therapists in Russia are expressing interest in phase-oriented therapy, as well as in other approaches that integrate the theory of structural dissociation of personality, for example, to the Progressive Approach in EMDR invented by D. Mosquera and A. Gonzalez. Dolores Mosquera supports and supervises EMDR Russia. At supervisions EMDR specialists regularly raise the question of dissociative symptoms and disorder are common among clients and patients in their practice. Gradually, the first scientific articles on the problem of chronic trauma and dissociation psychotherapy in the EMDR approach are appearing in the Russian scientific journals, in particular, the article “Eye Movement Desensitization and Reprocessing (EMDR) and the theory of structural dissociation of personality (TSDP) when dealing with complex mental trauma” (E. Kazennaya, E. Divid, 2017). Within the framework of EMDR Russia, there evolved a great interest in the theory of the structural dissociation of personality and the therapy of dissociative disorders. The arrival of Onno van der Hart in November 2017 in Moscow became a significant event for the psychotherapy of chronic trauma in Russia. He has introduced the professional community and the representatives of other approaches who had expressed interest to the theory of structural dissociation of personality and spoke about the basic principles of phase-oriented therapy. In March 2018, Suzette Boon visited Moscow and shared her invaluable experience in the diagnosis and differential diagnosis of dissociative disorders. It was the first time that the diagnosis of dissociative disorders received great exposure in professional community in this country. Further visits of Suzette Boon to Moscow are already scheduled, thus the introduction of specialists in the phase-oriented therapy will continue. EMDR Russia is keen on maintaining interest in this approach, as EMDR therapists often encounter clients who experienced chronic severe abuse in childhood and working with them demands additional training beyond the scope of standard EMDR studies. The community is currently discussing the first experience in applying a semi-structured diagnostic interview of trauma and dissociation symptoms of S. Boon and H. Matthess (TADS-I, version 1.9). The first psychiatric committees are held to clarify the diagnosis in case a dissociative disorder is recognized. Thanks to the support of Onno van der Hart and Suzette Boon, Russian specialists have the opportunity to look at the dissociative disorders from a new perspective. Interest in the scientific school that develops the theory of structural dissociation of personality is promoted by the leading pedagogical university in Russia, where future teachers, specialists working with children of special needs, and teacher– psychologists (psychologists working in the educational system) study trauma psychology to prevent violence in the educational environment. E. Kazennaya created a scientific group at the all-university department of psychological anthropology at the Institute of Childhood in the Moscow State Pedagogical University. The group in question develops courses on the psychology of trauma in education. The courses include a block dedicated to the theory of structural dissociation of personality by Onno van der Hart and others. In 2017, Onno van der Hart gave an open lecture on “From Freud’s disavowal of the notion of traumarelated dissociation to the struggle to re-integrate it in psychoanalysis: The harmful role of attachment trauma”. The Russian Federation is a vast country with a rich history. Each region has its own unique path in the development of scientific interests. In the present article, by describing the situation in the country the authors refer to the Central (with a centre in Moscow) and North-West (with a centre in St. Petersburg) Federal Districts; however, at the moment, other regions are interested in the problem of chronic trauma and dissociation, for example the Far Eastern Federal District (with a centre in Khabarovsk). The Department of General Psychological Disciplines at the Pacific State Medical University under the Russian Ministry of Health Care in Vladivostok invited us to speak on the issue of sexual abuse in childhood and dissociation at the International scientific-practical conference “Personality in extreme circumstances and critical life situations” (Vladivostok, 2018). At the moment, we are discussing the chances to continue this cooperation with the department of general psychological disciplines of the Medical University of Vladivostok. In the future, we plan to conduct research on the prevalence of dissociative symptoms and disorders in a clinical sample (inpatient and outpatient), and also adapt the TADS-I by Suzette Boon and Helga Matthess for use in Russian samples (E. Kazennaya, E. Divid, O. Bogolyubova, R. Kadyrov). We would like to express immense gratitude for support of our initiatives in Russia to Onno van der Hart and Suzette Boon.